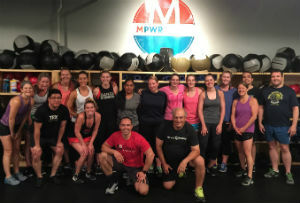 The MPWR Fitness family opened the MPWR House doors in November 2016 with the goal of providing a judgement-free zone where people from all walks of life – students, new and veteran athletes, busy professionals, retirees, you name it – can all exercise together in a unique environment that combines the comfort a home gym with the new daily challenges of professional training. 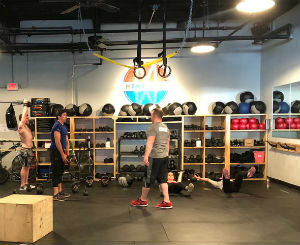 The MPWR House is also the proud home of Ninth Square CrossFit. 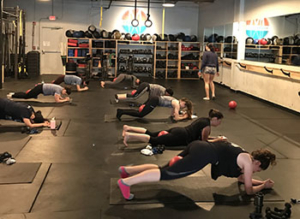 In addition to traditional bootcamp style classes, MPWR also offers a variety of other workout programs, from high-intensity interval training, to yoga and pilates-based programs, to barre and dance movements, to core and strength-focused classes, to cardio kickboxing and an outdoor running club. 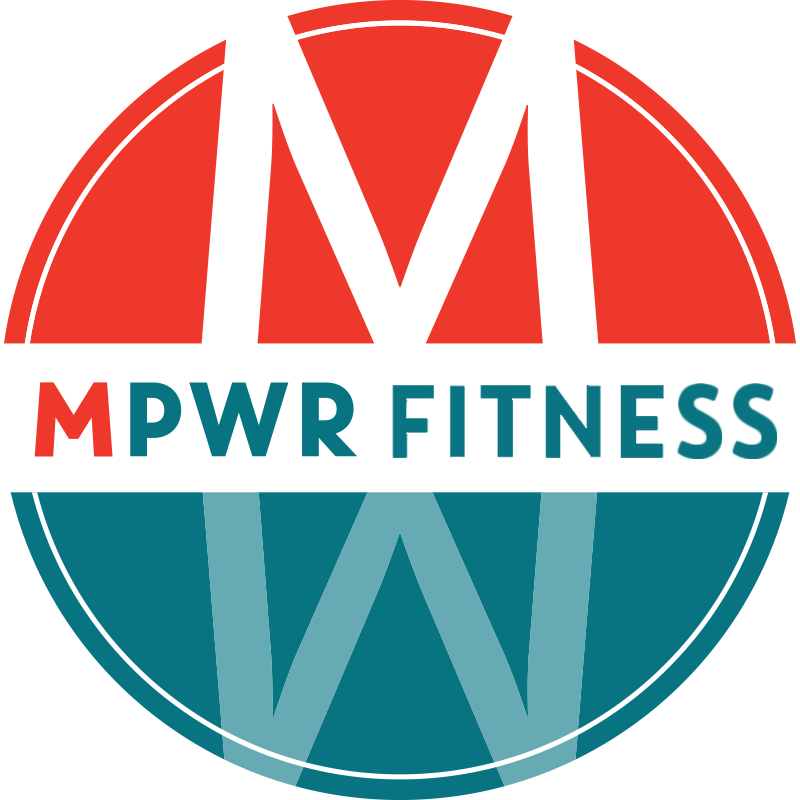 At MPWR, no two classes are ever the same. 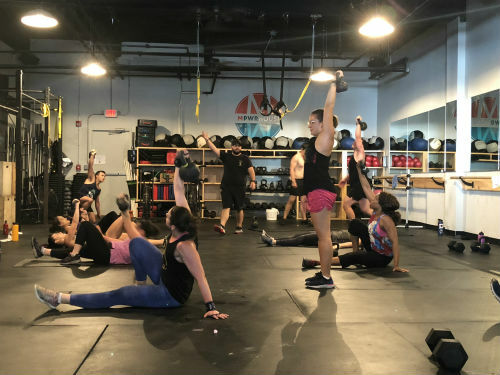 We promise to give you an experience above and beyond your daily workout routine, so that you can feel empowered to conquer another fitness challenge! Every class pass includes access to our individual showers, day lockers, and towel service. We are located in the center of downtown New Haven (one block from the historic New Haven Green), within walking distance from Yale University, Gateway Community College, and Yale-New Haven Hospital. 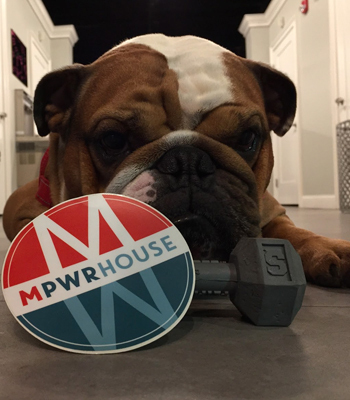 Make the MPWR House your house today! Ray became involved in CrossFit on February 8th, 2010 on the eve of his 60th birthday…and frankly, it saved his life. He had a history with sports – especially baseball. Now, he plays golf. But as a trial lawyer, it became obvious to him that being physically fit was just as important as native intelligence. 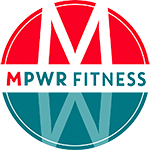 So, MPWR was born of the perceived need for structured, class-based fitness programs for active people living active lives.. Our programs can help anyone motivated enough to come to class become fit. It’s a matter of consistency. YOU have to come and do the work. Dave (aka “Rilla”) is our head trainer. He holds a B.S. in Exercise Science from SCSU and various CrossFit certifications. 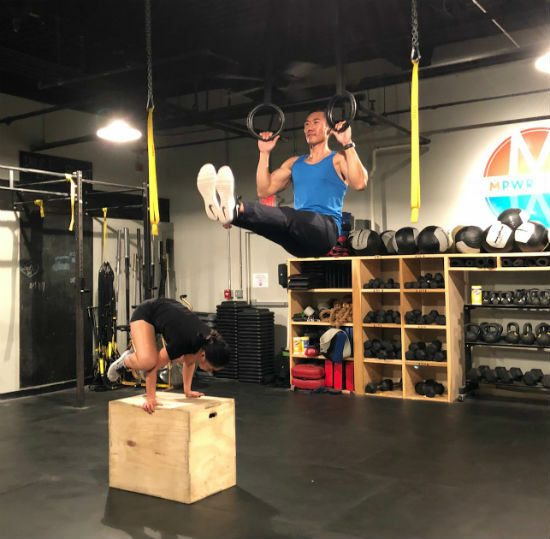 He has been training and competing in CrossFit for a loooong time – in 2011 he was a member of Shoreline CrossFit’s Team that won the Northeast Region during the CrossFit Open and then competed in the Northeast Regional. As our head trainer, Dave does the programming for all of the CrossFit classes. He sets the rhythm and tone of MPWR’s classes and trains the coaches. Dave emphasizes full range of motion and works towards flexibility. He programs to avoid injury and still push athletes to test themselves each day, no matter whether the work out is. When he’s not programming or coaching for MPWR you can find Dave fixing up houses with his company, Rilla Painting, or spending time with his family. Michael may be working for Yale School of Medicine, but don’t let that fool you. 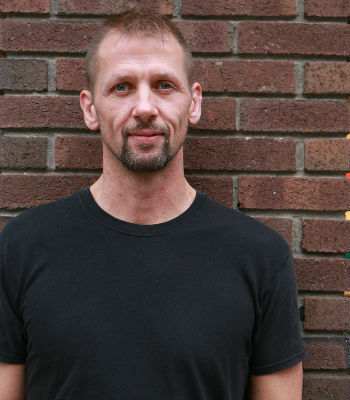 He’s a spin coach, a rowing coach, and an all-around fitness enthusiast. He is kind, outgoing, competitive, and loves emphasizing fun while meeting your fitness goals. In his spare time, Michael enjoys eating, traveling, and living life to its fullest! His passion always delivers an incredible workout that is not to be missed. Michael promises to give you the best workout of your day, if not your week. He is the Chief of Staff at Yale School of Medicine with an MBA from the Simon Business School at the University of Rochester. Michael is NASM and L1 CrossFit certified. Natalie hails from the Midwest. She grew up dancing competitively and always embracing an active lifestyle, from running, to swimming, to weightlifting. Natalie decided to get AFAA Group Fitness Certified so she could share her passion for movement and exercise with others. 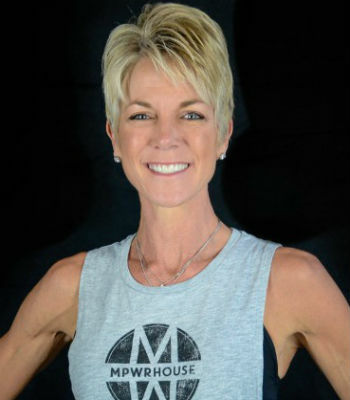 At MPWR she uses her background in dance to teach Barre classes and her love for combining strength and cardio to teach HiiT/Functional Fitness classes. Natalie maintains the outlook there are many reasons to exercise and you have to take control of your work out in order to best fulfill your goals and motivations. Somedays you just need to sweat; other days you want to lift heavy things. Plus, given her background in dance, she is a stickler for form. When not in the gym, you can find Natalie on Yale’s campus working on her PhD in Social Psychology. Lisa spent 15 years swimming competitively at the club team, high school and collegiate levels. After college, she continued to share her love for the sport with other athletes, coaching swimming for a club team in her hometown as well as for the high school where she was working as a teacher. 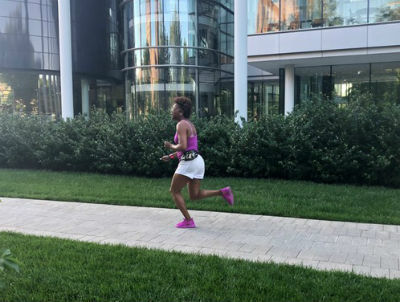 Lisa took her own fitness endeavors from the pool to the pavement, training for races ranging from a 5k to a full marathon. In 2015, Lisa tried her first barre class (a workout totally different than she was used to) and was hooked immediately! She practiced at a studio 3-4 days a week near her home in Massachusetts for 2 years. In the summer of 2016, her husband’s job brought her to Connecticut. 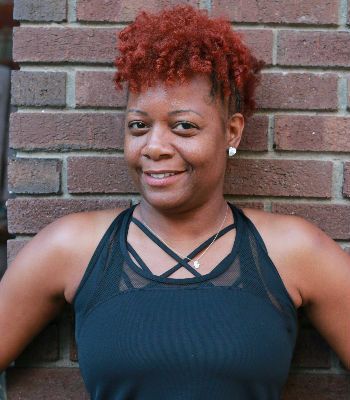 One of her top priorities was finding a place of community and fitness, where she was surrounded by others with a goal-setting mind who weren’t afraid to take chances. Recently, Lisa decided to combine her love of fitness and teaching and received her Mind Body Barre Fitness Instructor Certification. Her biggest goal is helping others to become the best version of themselves. She is a true believer that anything is possible with patience and perseverance. Besides teaching barre classes at MPWR, Lisa is also a 7th grade math teacher for the Meriden Public Schools. 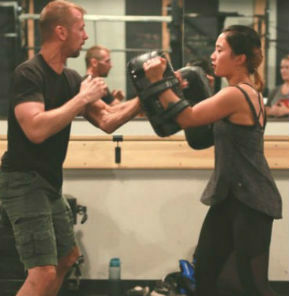 Adam has been immersed in martial arts for much of his life, with training as a professional MMA fighter and, beginning 15 years ago, as an instructor and coach. Adam is a trained expert in Brazilian jiu jitsu, mixed martial arts (MMA), Muay Thai, and wrestling. 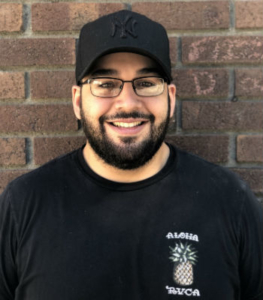 He teaches primarily adult and children classes at Ronin BJJ, but also has years of experience teaching fitness programs, community center workouts, and police arrest & control programs around New Haven. Now, he also directs the children’s martial arts program at BJJ – curating spaces of communication for youth that experience emotional and physical bullying. In his spare time he corners professional and amateur MMA fighters as happy adventures (check out Lisa “Insane” Blaine, one of his students), drives a truck for daytime deliveries, eats chocolate, and spends his downtime as a secret-introvert with his puggle, Diggy. Erica has been with the MPWR family since the very beginning. 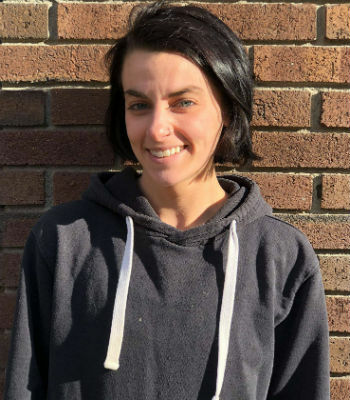 She is the brains of the operation, helping to oversee the staff, organize the website and Zen Planner member profiles, and maintain the gym’s social media presence. Got a question about your account? She’s got the answer. She also has a bulldog named Bentley– If you’re lucky, you might get to see him behind the desk. Ysa has had an active lifestyle since birth. Dance in Philly, competitive tennis in Florida, rock climbing with her then-boyfriend-now-husband Lee, and now as an MPWR team member. She has been to the gym almost everyday since early 2017, and loved the community so much that she decided to join the staff! You will often see her at the front – designing the gym’s advertisements as the creative designer and greeting each member with a smile. She is also no stranger to MPWR classes and will often be seen taking one (Barre!) when she is not teaching HiiT or Kickboxing. She is a medical student at the Yale School of Medicine, and is ACLS and BCLS certified. She also enjoys training for Kickboxing with Coach Adam, and going on family pack walks with husband Lee and dog Ollie. Wanda is another friendly face you’ll see behind the front desk. She was born in New Haven, CT. She is employed as an Account Assistant IV at the Yale School of Medicine. She is also currently pursuing a Liberal Arts degree at Gateway Community College…Wanda enjoys scrapbooking, traveling to exotic places throughout the world, and running. Her personal and professional affiliates are the Local Union 34, Black Girls Run, and The Autism Walk. She is happily married and has one daughter and two sons. Wanda enjoys scrapbooking, traveling to exotic places throughout the world and running. She has ran in over one hundred 5k, 10k, and half marathon races. In the near future, her goal is to run and complete a marathon. She considers herself to be an inspirer and motivator and believes that we are all responsible for the well-being and success of others. Wanda once heard a saying by a famous celebrity, “Don’t count the days; make the days count.” This is exactly how she lives her life. Tatum has been a dancer for over 25 years, having danced at Alyce Carella in West Hartford and Lime Lite Dance in Wethersfield. She attended the University of Vermont where she was on the dance team for four years and even performed at the NCAA basketball tournament. After college, she stepped away from dance and traveled the US, and then as far away as Australia and South Africa. 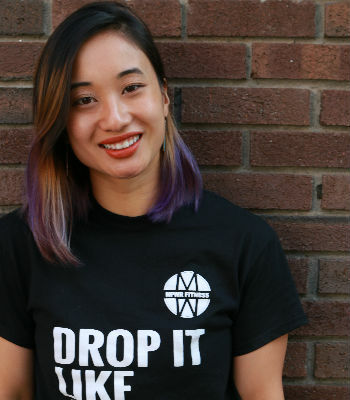 Throughout her career, she’s always found her way back to music and movement. 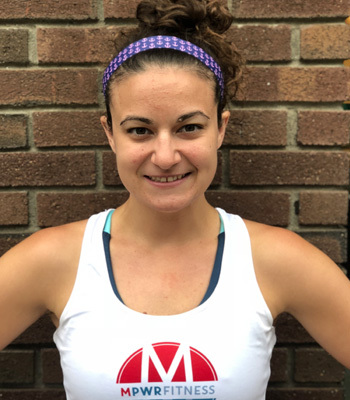 She is Total Barre and Total Barre Amped certified through Merrithew, and enjoys bringing her dance background and adventurous spirit into her classes and playlists! 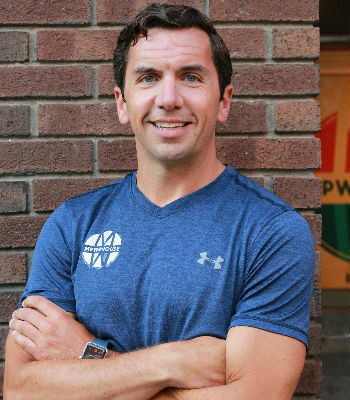 A fitness professional for over a decade, Dan is an American Fitness Institute nationally certified personal trainer as well as a nutritional and health coach. Working with a widely diverse range of clients: men, women and children (some as young as 7, some as old at 87! ), Dan is invigorated by customizing the exercise and health journey that each individual presents to him. 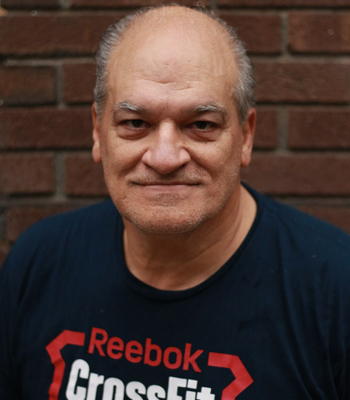 As an athlete and a coach, he has worked with and trained multiple All Americans – and is extensively trained in wrestling, boxing, and many aspects of mixed martial arts. He loves to get physical and use his experience to deliver high energy, exciting, and effective workouts to his clients. Coach Danny comes to us from Babylon, NY. He graduated with an Associate’s degree from Suffolk County Community College and has five years of coaching experience. He currently holds a CrossFit Level One Certification, along with specialty certifications in CrossFit Weightlifting and CrossFit Kids. Danny has trained local soccer and lacrosse teams, and has coached members through competitions. 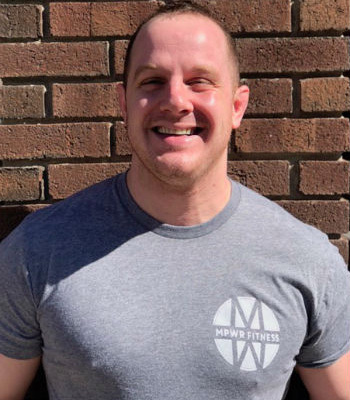 After taking some time off from coaching to explore his passion for cooking, Danny is eager to get back into the gym and help the MPWR community reach their goals. Ginnie has been involved in sports and fitness for the better part of the last ten years. From pole-vaulting and hurdling on her track team, to running cross-country, to playing tennis; she’s no stranger to high intensity workouts. 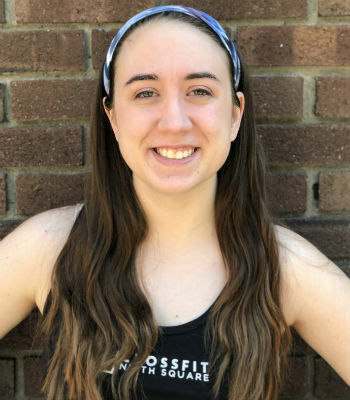 Although she took a break from the fitness realm during the first two years of college, she got back into it by becoming a kickboxing instructor and training for/running a half marathon! 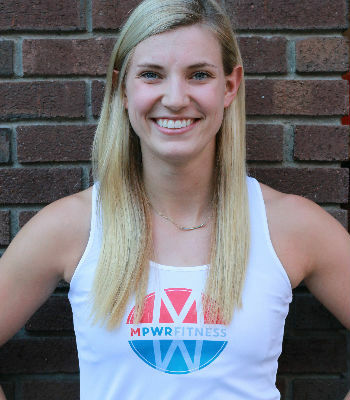 At MPWR, she’ll use her skills and background to teach MPWRFit and the occasional Kickboxing class. You’ll also see Ginnie’s friendly face behind the desk, so don’t be afraid to say hi! Ginnie is a strong believer that success is dependent on effort, both inside and outside of the gym! When’s she’s not working out, she can be found at your nearest library reading up on current events and recent court cases or finding the newest crime shows on television. She is pursuing her J.D. at Quinnipiac University School of Law. 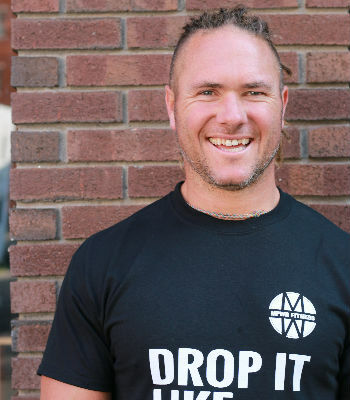 Coach Matt has been involved in sports and fitness most of his life, with a competitive athletic background in lacrosse and wrestling. 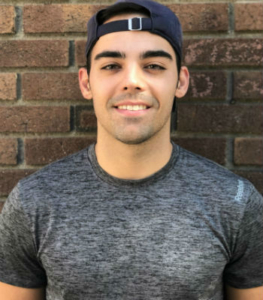 He is currently pursuing an SCSU degree in Interdisciplinary Studies, combining his interests in exercise science, nutrition, and business. 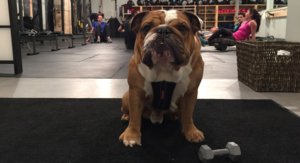 He is also training for his CrossFit C1 Certification. Matt loves working out, especially with others. He loves to help clients identify “impossible” fitness challenges and empower them to achieve their goals! 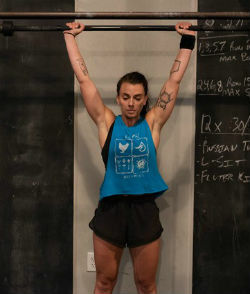 Chelsea has been a fixture in our early morning CrossFit class for over a year. She recently completed the L1 CrossFit coaching course. We are now welcoming her to our coaching staff. She is a former public school educator, working on her PhD in Leadership and Education Policy at the University of Connecticut. Chelsea has always been ready to learn something new – academic or physical — with a particular preference for adventure sports. 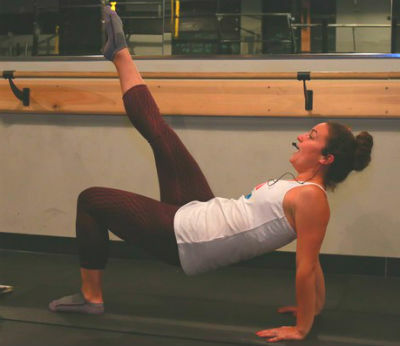 After years pursuing her own journey to a mindful and balanced approach to fitness, she is inspired to empower other women, informed by evidence-based programs for strength training and nutrition. She wants to help break habits related to what women are conditioned to believe and say about their bodies. 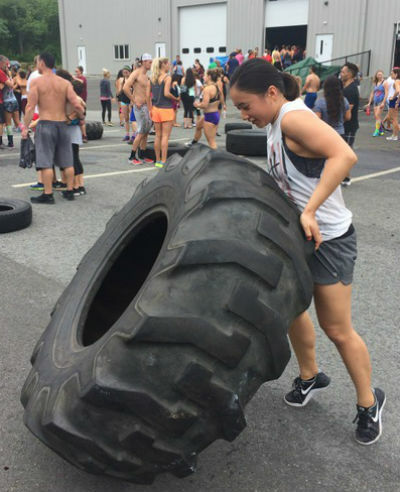 She believes fitness and CrossFit – as a form of broad, general, and inclusive fitness – is for everyone and is a means to meet a myriad of goals. During various times of her life, usually when she least expected it, she has experienced the invaluable inspirational impact of a great instructor or coach. We believe that she can be that source of energy for you. Heidi holds many certifications in group exercise, indoor cycling, and personal training. 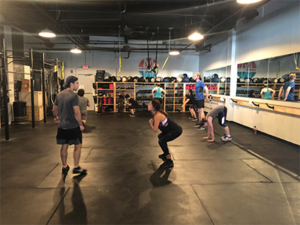 She has spent many years running and still runs her own PT Company, Simple Fitness, in Guilford, CT. She brings 30 years of experience training the trainers as well as the clients! She loves to teach … she loves helping our clients be the best they can be! 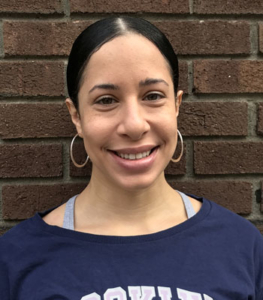 She specializes in functional strength training which balances the body and strengthens you so that you can perform all movements you use on a daily basis. She believes that strength comes from the core outward! 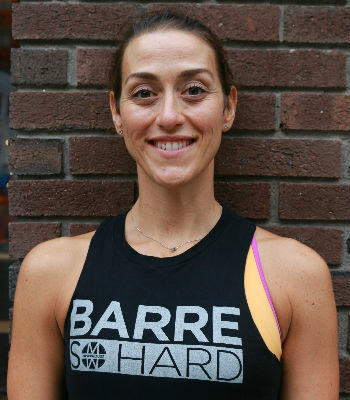 She excels at Barre, Cycling, HiiT, Rowing, and more. She looks forward to seeing you in the gym! She has a BS from Carnegie Mellon University in Materials Science & Engineering with an additional major in Biomedical Engineering. By day, she’s an engineering project manager for a medical device manufacturer. Dom was a competitive gymnast and dancer for many years and recently became a huge fan of mixed martial arts. In January 2019, she competed in her first Brazilian jiu jitsu grappling tournament. 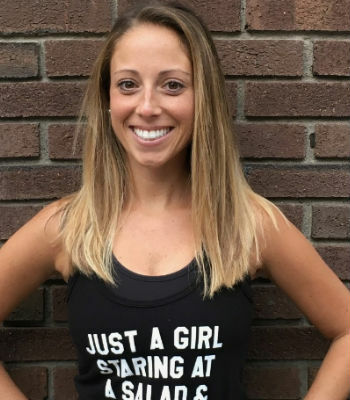 She decided to get her ACE Group Fitness Instructor certification because she is passionate about fitness and want to spread that passion to others. Dom is certified through Barre Above and love creating fun, motivating playlists! You can come as often as you’d like. We offer drop in classes, monthly memberships, and 10-class packages. If you can’t find what suits your needs, check in with the team member at the front desk. We’ll hook you up! Give us a try by signing up for a free trial class below. Already know you’re going to love us? Sign up for a membership or non-Saturday drop-in pass below. How do I take my first free introductory class? You can sign up online for a free trial class here. Come 10 minutes before your intended class so we can give you a tour of the MPWR House and verify your registration with any form of valid government ID. We’ll take care of you! I’m out of shape - can I do this? Our coaches have a wide range of experience training expert athletes and beginners alike. Prior to class, coaches will assess your skill level and goals. During class, coaches will continue to work with you to ensure that you get the best workout of your day. We focus on teaching you good form and movement quality. Everyone started somewhere, and we are the best place for you to start! I’m only in town a few times for business. How can I become a member? We have a lot of clients who are visiting on business, checking out a local college, or just passing through the area. If that’s you, consider purchasing a drop-in class pass or a ten-class pass. I’d like to host a team building event. We love to throw a party! Email us at least a week in advance at [email protected] and we’ll create an event specifically for YOU! From Corporate events to bachelor parties, we do it all. We can have a post-workout party at our studio, or we can arrange to move the event to a local restaurant. Every class is designed to accommodate the first-timer. We suggest signing up for our free trial class – we know you’ll love it! Can I have a private coach? YES! Absolutely! Just email or book online for rates and times. Let us know if you have a preferred workout program or coach in mind. Beginning March 19, 2018, we will enforce the following no-show procedure on anyone who registers for a class and does not show up to take the class. If you preregister for a class and do not show up and do not cancel the preregistration or send us an email to [email protected] no less than one hour before class telling us you will not attend, then we will charge you $10 per no-show. If you preregister/no show twice in a month, your privilege to reserve a spot in a class will be suspended for the remainder of the month. If within one hour of class you decide you cannot make the class, email us at [email protected] (do not call) and tell us why and the reason will be considered on a case by case basis.